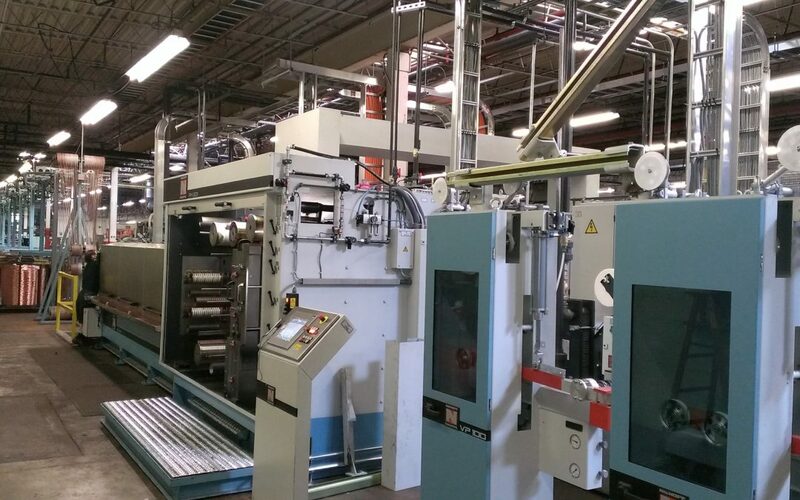 Kalas is excited to announce the commissioning of our new 28-wire Niehoff drawing machine at our 25 Main Street Denver, Pennsylvania location. The investment in this new equipment offers customers 11 million pounds of incremental copper capacity, and supports our growth strategy. At Kalas, we believe in servicing markets and supporting the product needs of our valued partners. Our investment in the Niehoff enables us to grow in many of our markets – bare & tinned copper, welding, construction, truck & bus, marine and more. It also increases our manufacturing capability beyond 0.010” to include a 0.0063” ultra-flexible strand specification, which offers additional opportunities to our customers. 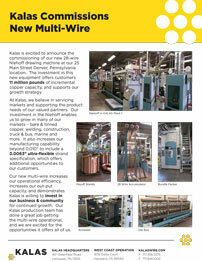 Our new multi-wire increases our operational efficiency, increases our out-put capacity, and demonstrates Kalas is willing to invest in our business & community for continued growth. Our Kalas production team has done a great job getting the multi-wire operational, and we are excited for the opportunities it offers all of us. Click for full article with more pictures.